Why it’s better to learn to fly at a controlled airport? Poznan International Airport is the largest airport in Greater Poland. It’s also one of the oldest in Poland, built in 1913. Every day thousands of passengers are checked-in. The biggest traffic occurs in the morning and afternoon. Most part of the day traffic is low enough to let us easily conduct our training flights. Our school is located in the General Aviation Terminal building. Location at Poznan International Airport has great advantages. Runway and taxi ways are always well prepared and free of any contamination what makes flying possible all time of the year. Air Traffic Control is provided 24 hours per day. Our students during basic training learn how to make ILS, VOR and RNAV approaches. 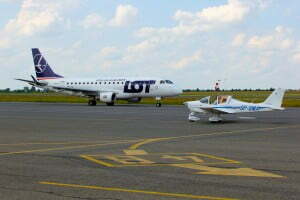 No other airfield in the vicinity provides such convenient conditions for training like Poznan International Airport. Flight training in a controlled airspace helps to gain valuable knowledge and flight experience in real aviation environment.